Affinity chromatography is undoubtedly the most potent way to separate one active compound from its environment. This strategy is illustrated by the use of Protein A for the purification of monoclonal antibodies. The lack of specific-enough ligands has up to now hampered the adoption of affinity chromatography for other biologics such as blood products, vaccines and antibody fragments. Nanofitins® allow capture and elution of selected macromolecules ranging from small peptides to viruses. The conserved region, common to all Nanofitins®, bears the regions used for conjugation to resins, beads, membranes, … In particular, regio-selective conjugation is possible through insertion of one single Cysteine in the Nanofitin® sequence, thereby offering identical thiol-based covalent coupling. All Nanofitins® can undergo the very same process for incorporation into chromatography media, with similar behaviour in terms of association to the material. Through the European project DiViNe, Affilogic and 5 other partners are combining their respective technologies to improve purification of vaccines by affinity chromatography, with the prospect of extending this process to most biologics products. Nanofitins® can be used for detection needs as well. In previous research at Affilogic, tags were added at the N- and/or C-terminus (His-Tag, Strep-Tag, Avi-Tag, Flag-Tag), enzymes were chemically and genetically fused to the Nanofitins® (GFP, HRP, AlkPho), and dyes were chemically conjugated either on the various exposed Lysines on the Nanofitins®, or at a specific site with the addition of one specific Cysteine. It was checked that these modifications did not induce any change in binding efficacy and specificity. Nanofitins® can thus be adapted to a broad range of assay protocols (multiplex lateral flow, immunoassays, FACS, immuno-histochemistry…), for single target as well as multiplex detection. 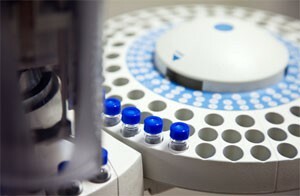 The objective is to take advantage of the intrinsic features of Nanofitins® to develop highly stable diagnostic tools amenable to Point of Care (POC) tests, in order to detect with high sensitivity a wide range of antigens in the body sample chosen, possibly non-invasively (stool, saliva, urine), with a fast generation process and at affordable costs compatible with large-scale screening of populations. Antibodies currently available for detection purposes are largely unstable as soon as they are used in natural aggressive substrates (acidity, proteases) or in extreme conditions (in particular no temperature control).